I found the Fed’s latest (Q2) Z.1 report particularly interesting. It brought back memories. In general, debt growth was steady and rather uninteresting. As such, it would be reasonable to equate the seemingly placid Credit backdrop with an extraordinarily long period of low securities market volatility. Yet there’s another dynamic to contemplate (and carefully monitor). Below the surface the financial sector is turning increasingly unstable. Latent financial instability has begun to surface. And, sure enough, acute monetary disorder ensured that securities markets succumbed to speculative blow-off dynamics. Q2 2017 Non-Financial Debt (NFD) expanded at a 3.8% rate, up from Q1’s 1.7% and Q4’s 3.1%. Household Debt growth increased from a 3.4% rate to 3.7%. Home Mortgage Debt expanded at a 2.8% rate, down from Q1’s 3.4%. Consumer Credit slowed to 4.6% from 5.2%. Total Business Debt growth slowed to 5.3% from Q1’s 6.1%. After contracting at a 2.6% rate during Q1, Q2 saw Federal borrowings increase at a 3.6% rate. With system debt having inflated for decades now, today’s percentage changes don’t do justice. Plus, with interest rates so low, interest compounds much less than in the past – thus working to restrain overall debt expansion. But let’s examine nominal data. On a seasonally-adjusted and annualized (SAAR) basis, Non-Financial Debt expanded at a $1.813 TN pace during Q2 (up from Q1’s $794bn). This compares to annual growth of $2.095 TN in 2016, $1.958 TN in 2015, $1.792 TN in 2014 and $1.547 TN in 2013. Total Household borrowings increased SAAR $542 billion during Q2. For comparison, Household borrowings expanded $510 billion in 2016, $403 billion in ‘15, $400 billion in ‘14, $241 billion in ’13 and $265 billion in ‘12. Household borrowings contracted in 2011 ($51bn) and 2010 ($60bn). Total Business borrowings slowed to SAAR $724 billion, down from Q1’s $817 billion. Borrowings nonetheless remain robust, tracking above 2016 annual borrowings of $711 billion and not far below 2015’s $820 billion (strongest since 2007). On a year-on-year basis, the Federal government borrowings have shown the largest slowdown. This won’t last. Federal Government Liabilities ended Q2 at a record $18.651 TN, up from $8.056 TN to end 2007. As a percentage of GDP, Federal Liabilities have increased from 55% to 97%. Outstanding Treasury securities ended Q2 at $15.798 TN, up 160% from the $6.051 TN to end 2007. Somehow there is still talk of “deleveraging” in the face of one of the great bouts of government indebtedness. Meanwhile, outstanding Agency- and GSE-Backed Securities ended Q2 at a record $8.667 TN. One of these decades there may even be GSE “reform.” GSE Securities increased $95 billion during the quarter, $343 billion over the past year and $888 billion over three years. Amazingly, with Fannie and Freddie remitting (accounting) profits back to the Treasury, the government sponsored enterprises these days have no meaningful capital base (Z.1 has GSE assets less liabilities at a paltry $6.0bn). Complacency may come easy to those viewing relatively modest annual percentage growth in household, corporate and federal debt. Indeed, most at this point completely dismiss the Credit Bubble hypothesis. Yet there is plenty of support for The Bubble Thesis buried throughout the Fed’s Z.1 report. The Security Broker/Dealers expanded Financial Assets SAAR $567 billion during Q1. The quarter saw the strongest growth since Q1 2010. “Security Repurchase Agreements” jumped SAAR $263 billion, with Debt Securities up SAAR $154 billion. On the Liability side, Security Repurchase Agreements surged SAAR $329 billion and Corporate Debt Securities rose SAAR $144 billion. The explosive growth of the ETF complex runs unabated, as detailed in Fed data. ETF assets surged a nominal $170 billion during the quarter (24% annualized) to a record $2.944 TN. Total assets were up $715 billion y-o-y, or 32%. Interestingly, when ranked by “investment objective,” World Equities led the way during Q2. World Equities assets expanded $77 billion (53% annualized) during Q2 and were up $195 billion, or 42%, y-o-y. U.S. Equities gained $55.6 billion during Q2 and were up $429 billion, or 33% y-o-y. Taxable Bond funds attracted $34 billion during the quarter, with assets up $95 billion y-o-y. Further indications of “Hot Money” On the Move: Bank “Holding Companies” saw Financial Assets jump SAAR $903 billion during the quarter. Financial Assets of “Funding Corporations” dropped SAAR $492 billion during Q2. Net Interbank Assets dropped SAAR $663 billion during Q2, after surging SAAR $1.582 TN during Q1 and declining SAAR $649 billion in Q4 2016. While Financial Sector Debt Securities holdings were relatively flat (up SAAR $31bn), a “risk on” dynamic was apparent with a SAAR $403 billion decline in Treasuries largely offset by a SAAR $308 billion increase in Corporate & Foreign Bonds. On the Liability side, “Federal Funds & Repo” jumped SAAR $698 billion and “Miscellaneous Liabilities” rose SAAR $662 billion. Speaking of “hot money”… Rest of World (ROW) saw “Net Acquisition of (U.S.) Financial Assets” surge SAAR $1.916 TN, this following Q1’s gain of SAAR $1.515 TN. In nominal dollars, ROW holdings of U.S. Financial Assets surged $1.336 TN during the first-half to a record $25.559 TN. At this pace, the growth in ROW holdings will easily surpass 2006’s record $2.143 TN. By category during Q2, ROW Debt Securities holdings jumped SAAR $1.214 TN, with U.S. Corporate bonds up SAAR $584 billion. Foreign Direct Investment increased SAAR $299 billion, a significant slowdown from the 2015/2016 pace. I hold the view that nontransparent derivative trading and associated leverage have been integral to the global government finance Bubble. QE and currency devaluation strategies created extraordinary opportunities for “carry trade” leveraged speculation. I believe enormous amounts of finance have been created in the process of shorting select currencies, most notably near-zero rate euro and yen securities. A large chunk of “money” flowed to “king dollar” U.S. securities markets, easily offsetting the (late-2014) termination of Federal Reserve QE. It is likely that huge flows are not being captured in Fed data – the Rest of World Z.1 data in particular. It was helpful to see the BIS put a $13 TN estimate on debt/leverage associated with unaccounted for foreign-exchange derivatives. Recall that 10-year Treasury yields traded as low as 1.36% in July 2016, only to reverse sharply to as high as 2.60% near year-end. I believe fear of a disorderly unwind of leveraged holdings was behind the Fed’s decision to back away from rate “normalization.” When the Fed then signaled that rate hikes had largely run their course, the veritable speculation floodgates were pushed wide open. The value of U.S. Equities jumped a nominal $1.50 TN during Q2 to a record $42.23 TN. Over the past four quarters U.S. Equities have jumped $6.182 TN, or 17.1%. For perspective, Equities rose about $3.9 TN in 1999 and $3.5 TN in 2006. The Q2 value of Equities was 67% higher than at the close of 2007. Equities ended Q2 2017 at a record 219% of GDP. Equities had cycle peaks of 181% of GDP during Q3 2007 and 202% to end Q1 2000. Equities were at 50% of GDP in 1975 and ended the eighties at 67%. Total Debt Securities ended Q2 at a record $41.502 TN, up $85 billion for the quarter and $977 billion y-o-y. Debt Securities-to-GDP slipped a basis point to 216% (began the ‘90s at 130% and ended the decade at 157%). This puts Total Securities at $83.733 TN, or a record 435% of GDP. Previous cycle peaks were 379% in Q3 2007 and 359% during Q1 2000. Policy-induced asset inflation has profoundly impacted Household Net Worth – or what I would refer to as “perceived wealth.” Indeed, the bloated Household balance sheet remains a primary Bubble manifestation. Household (& Nonprofits) assets ended Q2 at a record $111.4 TN, up $1.844 TN for the quarter and $8.660 TN (8.4%) over four quarters. Liabilities increased $146 billion during the quarter and $467 billion y-o-y – to $15.219 TN. Fundamental to the ongoing Bubble, Household Net Worth (assets less liabilities) jumped $1.698 TN during Q2 to a record $96.196 TN. Net Worth surged a staggering $8.193 TN over the past year (now 42% higher than the 2007 peak). For perspective, Net Worth jumped $4.894 TN during 1999 and dropped $10.240 TN during 2008. As a percentage of GDP, Household Net Worth reached 500% for the first time during Q2, up from cycle peaks of 473% in 2007 and 435% in 1999. I’ll have more comments about the Fed meeting next week. It was interesting to see chair Yellen refer to an inflation “mystery.” There was nothing too surprising with the Fed’s plan to reduce its balance sheet holdings. For good reason, the markets assume the Federal Reserve won’t get too far into balance sheet “normalization” before it suffers a change of heart. Recall that our central bank more than doubled holdings after scrapping its 2011 “exit strategy” before it even got started. I would add that bull markets create their own liquidity. And so long as “risk on” is fueled by self-reinforcing speculative leveraging, the marketplace would easily accommodate small portfolio sales from the Federal Reserve. It’s an altogether different story, however, when “Risk Off” materializes. De-risking/de-leveraging dynamics could rather abruptly emerge from hiding. That’s when the markets will sorely miss – and beckon for more - QE. Few papers written by defunct economists have had as much influence on my way of looking at markets as Irving Fisher’s seminal 1933 article “The Debt-Deflation Theory Of Great Depressions.” In it, Fisher hypothesized the patterns that great depressions go through. In a nutshell, great depressions go through four phases. 1) The phase of price inflation. Nominal rates go up, while real rates go down. It thus pays to borrow in order to buy real assets. Servicing debt may be difficult should there be a temporary liquidity crisis. But repaying principal when loans mature is not a problem. During this phase nominal interest rates can reach very high levels. In this period there is a high velocity of money. 2) The phase of asset inflation. Nominal interest rates go down structurally, but real interest rates go up. This monetary illusion gives borrowers the false impression that borrowing is very cheap, since the nominal cost keeps going down. However, the reality is that while servicing debt is cheap, rising real rates make repaying principal tougher and tougher. During this period the velocity of money remains strong, with most of the money going to buy existing assets. One day the return on invested capital falls below the cost of capital, and the economy moves into the next stage. 3) The phase of debt deflation. Every borrower struggles to repay debt. The velocity of money collapses, which causes prices to collapse, which leads to higher real rates. Historically it takes around 10 years for the banking system to finish going bust, which naturally keeps the velocity of money suppressed. 4) The final phase is what 19th century economists called the secondary depression, which can last as long as 20 years. During this phase not much happens for as long as the generations who suffered from the financial collapse and the debt deflation are still around. In this period, the velocity of money remains close to zero, with nominal interest rates also close to zero but offering a positive real yield. This makes plenty of sense. If by now you are marveling at how closely Japan’s economic trajectory over the last 45 years or so has fitted Fisher’s theoretical framework, you are not alone. 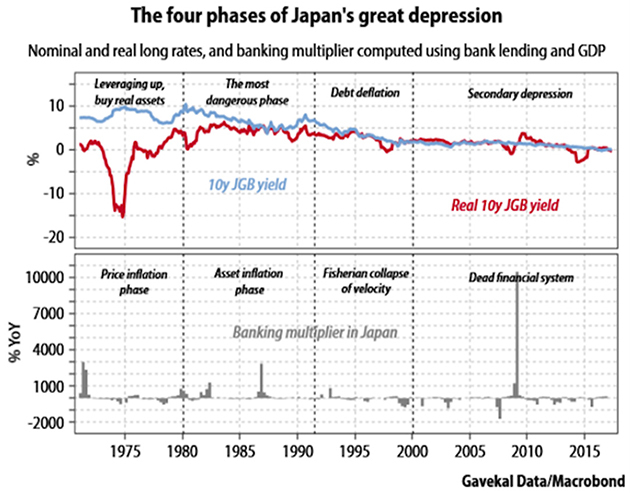 As the chart below shows, Japan is now approaching the 18th year of its secondary depression. So as the economy continues to follow the path mapped by Fisher, investors should start to look for signs that Japan is beginning slowly to emerge from this secondary depression phase. One sign would be a rise in the velocity of money as commercial banks start to lend again. And guess what? If you use a microscope, you can see that the velocity of money in Japan is indeed starting to creep up. Admittedly, the increase is small, just 2% year-on-year, but everyone has to start somewhere. I am starting to wonder if Japan, having been the first economy to enter debt deflation, will now be the first to emerge from it. After all, companies in Japan have close to US$4trn in cash. They are trading on a “normal” P/E ratio. Corporate profits have been growing at a faster rate in Japan than in the US for the last five years. And during that time the Japanese stock market has massively underperformed US shares. On top of that, Japan is the world leader in everything to do with labor shortages. And according to Will and Udith a labor shortage is exactly what much of the developed world is facing (see It Is Not Slack Weighing On Wages). Money managers own too few Japanese equities, especially in sectors where Japanese companies are world leaders. The yen is grotesquely undervalued on a purchasing power parity basis versus most other currencies. The best performing currency in the next five years should therefore be the yen. If a manager wants to hold cash, in my opinion he should hold cash in yen. For an international bond portfolio, owning the short-dated part of the yen yield curve could make a lot of sense. The great beauty of these recommendations is that nobody, but nobody, is positioned accordingly. Merkel Lands Fourth Term, But at What Cost? Angela Merkel will serve as Germany's chancellor for a fourth term, but Sunday's win comes at a high price. The right-wing populists are now the third-strongest party in parliament and her negotiations to create a new government are likely to be complicated. Angela Merkel's election result four years ago was, to be sure, extraordinary. It was clear from the surveys that her conservatives wouldn't be able to repeat it. But a fall like this? Merkel's Christian Democratic Union (CDU) and its Bavarian sister party Christian Social Union (CSU) saw their joint result fall by more than eight percentage points -- their worst showing since 1949. During her first appearance after the election at her party's headquarters, the chancellor said she had, in fact, hoped for a somewhat better result. Those gathered at the headquarters dutifully chanted, "Angie, Angie." Then things grew quiet again. Nobody waved the German flag. It was a far cry from 2013, when CDU politicians broke out into a spontaneous karaoke session after the results were announced. This time, the prominent members of Merkel's party who had gathered behind her on the stage seemed sobered by the tepid showing. Merkel can keep her job as chancellor, the "strategic goal" has been achieved, as Merkel refers to it. But it comes at a high price. Voters have severely punished the parties of the current governing coalition, with Merkel's conservatives losing dozens of seats in parliament. The right-wing populist Alternative for Germany (AfD) will now enter parliament with a strong, double-digit result. And it will be extremely difficult for Merkel to build a government coalition that will be stable for the next four years. The AfD: There won't just be a sprinkling of renegades representing the AfD in parliament. The right-wing populists will be the third-largest party in the Bundestag and they have announced their intention to "chase down" the chancellor as one of the party's two leading candidates expressed it on Sunday. The election campaign already gave a taste of what might be coming, with AfD supporters loudly venting their hatred and anger at events held by Merkel's CDU. Merkel, who isn't known for being the world's best public speaker, will now be confronted by them on a daily basis. And the conservatives will also have to ask themselves what share of the responsibility they carry for the AfD's success. What can they do to win back disappointed voters? More than a million voters are believed to have flocked from the CDU and the CSU to the AfD. And most of them say that it was the chancellor's refugee policies that led them to vote for the right-wing competition. It's little wonder, then, that Merkel has identified the enduring regulation of refugee flows and domestic security as the key topics for the coming years. She said on Sunday that she wants to win back voters from the AfD and described the party's move into the Bundestag as a "major new challenge." The CSU: CSU head Horst Seehofer has a pretty clear opinion on how to succeed in diminishing the AfD's fortunes moving forward. He wants to use "clear positions" to close the "open right flank" of the CDU and CSU. But that pledge to shift the conservatives to the right could also create new fault lines between the CDU and CSU. The CSU faces state elections in Bavaria in 2018 and support for the party collapsed on Sunday. Ahead of the election, the CSU and CDU had managed to put thin bandage on the issues that divide them -- such as the CSU demand for an upper ceiling on the number of refugees taken in by Germany. But those wounds are likely to reopen in the coming weeks. Creating the next governing coalition: Social Democratic officials left no opportunity unused on Sunday night to declare that they are not interested in carrying on as Merkel's junior coalition partners. Mathematically, it would be possible for the parties to govern together, a visibly irritable Social Democratic chancellor candidate Martin Schulz said on Sunday. But politically it would not be. A few CDU representatives, including Merkel herself during a television discussion between all lead candidates on Sunday evening, appealed somewhat half-heartedly to the Social Democrats' political responsibility to the state. But it appears that Merkel's sole path to a majority is a coalition with the Free Democrats (FDP) and the Greens. At the same time, forging a government coalition comprised of four different parties -- the CDU, CSU, FDP and Greens -- will be no easy task. From refugee policies to climate protection and the common European currency, there are plenty of differences between the parties to discuss. Still, CDU leaders did express relief on election night that both the FDP and Greens had achieved solid results. That may make it easier for the two parties to accept the responsibility that comes with entering into government. The successor debate: Who will succeed Merkel? Considering the weak result, this question is likely to arise even more quickly than previously anticipated. Merkel is likely to face a discussion within her party about its future direction -- and not just because of the CSU. Young and ambitious party leaders like Jens Spahn are also likely to ask what direction the party needs to take in order to bring it closer to the kind of election results it used to enjoy. The evening that Angela Merkel secured her fourth term in the Chancellery could also mark the beginning of the debate over who will one day inherit the office from her. Few issues in central banking are more likely to provoke anxiety than the fear of losing control of one’s currency. The past few days have provided another perfect illustration of this point. On Monday the Chinese central bank banned initial coin offerings of bitcoin-type currencies, leading to a fall in the value of some cryptocurrencies of as much as 20 per cent. Behind the scenes, there is growing uneasiness about how disruptive technology may be to the banking and payments system. Over the summer both the Basel Committee on Banking Supervision and the World Economic Forum put out lengthy papers on their concerns and the state of play. So far, the big winners from new technology have been clients. Fintech innovators in banking appear to have been less disruptive than expected because they have largely failed to change the basis for competition in such a regulated industry, the WEF report argues. Instead, technology has led to a marked improvement in customer service and a sharp fall in the cost of payments. But, beyond resilience to cyber attacks, there are three broad concerns. First, will the banks, which they have spent so much time trying to make safe, be weakened by new entrants? Simply put, will banks be “Amazon-ed”? Bankers used to think regulation would make financial services less appealing for new entrants. But now the penny is dropping that non-bank rivals can target more profitable areas and skim the cream, leaving regulated banks less profitable. Second, will banks become less important as more lending shifts beyond the regulatory perimeter? Since 2009, swaths of business have moved from banks to asset managers. More than $600bn has been raised to fund private debt, according to market data company Preqin. As a result, policymakers are spending more time analysing the non-bank sector. The growing dependence of banks on large technology firms to run their infrastructure is also giving policymakers pause for thought about who is systemically important. Third, would central banks lose control of payments if privately issued bitcoin currencies were to take off? Issuing currencies is a lucrative business as central banks pocket the difference between the cost of issuing a coin or bank note and its face value. Central banks also fear their ability to monitor the payment system would fall. Given the global fight against terrorism and organised crime, this is an acute concern. In an extreme scenario, central banks fear they may even lose control of the money supply. Until recently, policymakers had not worried too much about cryptocurrencies — they provided few benefits as a currency, apart from to those simply trying to hide their tracks. They are not a “store of value”, as Monday’s move showed. They are not widely enough accepted to be a useful medium of exchange. And digital currencies have failed to be as secure as promoted — they have been successfully hacked several times in the past 12 months. But as cryptocurrencies grow, we should expect more central bankers to look to outlaw or crimp their use. This will be most acute in markets that are worried about capital flight and organised crime. This will not stop speculators and enthusiasts, but will limit their potential to create the powerful network effects that would make them a useful parallel currency. But perhaps these concerns should prompt central banks to make their own currencies more appealing. Clearly, more efficient protocols for electronic payments would help and there is much to learn from bitcoin technology. But more profoundly, this is another reason why the European Central Bank, Bank of Japan and others should look to exit their dangerous experiment of negative interest rates sooner than later. How Much Does Trump Matter? CAMBRIDGE – The United States has never had a president like Donald Trump. With a narcissistic personality and a short attention span, and lacking experience in world affairs, he tends to project slogans rather than strategy in foreign policy. Some presidents, like Richard Nixon, had similar personal insecurities and social biases, but Nixon had a strategic view of foreign policy. Others, such as Lyndon Johnson, were highly egotistical, but also had great political skill in working with Congress and other leaders. Will future historians look back at Trump’s presidency as a temporary aberration or a major turning point in America’s role in the world? Journalists tend to focus too heavily on leaders’ personalities, because it makes good copy. In contrast, social scientists tend to offer broad structural theories about economic growth and geographic location that make history seem inevitable. I once wrote a book that tried to test the importance of leaders by examining important turning points in the creation a century ago of the “American era” and speculating about what might have happened had the president’s most plausible contender been in his place instead. Would structural forces have brought about the same era of US global leadership under different presidents? At the beginning of the twentieth century, Theodore Roosevelt was an activist leader, but he affected mostly timing. Economic growth and geography were the powerful determinants. Woodrow Wilson broke with America’s hemispheric traditions by sending US forces to fight in Europe; but where Wilson made a bigger difference was in the moral tone of American exceptionalism in his justification of – and, counterproductively, his stubborn insistence on – all-or-nothing involvement in the League of Nations. As for Franklin Roosevelt, it is at least debatable whether structural forces would have brought the US into World War II under a conservative isolationist. Clearly, FDR’s framing of the threat posed by Hitler, and his preparation for taking advantage of an event like Pearl Harbor, were crucial factors. The post-1945 structural bipolarity of the US and the Soviet Union set the framework for the Cold War. But a Henry Wallace presidency (which would have occurred if FDR had not switched him for Harry Truman as vice president in 1944) might have changed the style of the US response. Similarly, a Robert Taft or Douglas MacArthur presidency might have disrupted the relatively smooth consolidation of the containment system over which Dwight Eisenhower presided. At the end of the century, the structural forces of global economic change caused the erosion of the Soviet superpower, and Mikhail Gorbachev’s attempts at reform accelerated the Soviet Union’s collapse. However, Ronald Reagan’s defense buildup and negotiating savvy, along with George H.W. Bush’s skill in managing the end of the Cold War, were important to the final outcome. Is there a plausible story in which, owing to different presidential leadership, America would not have achieved global primacy by the end of the twentieth century? Perhaps if FDR had not been president and Germany had consolidated its power, the international system in the 1940s could have realized George Orwell’s vision of a conflict-prone multipolar world. Perhaps if Truman had not been president and Stalin had made major gains in Europe and the Middle East, the Soviet empire would have been stronger, and bipolarity might have persisted longer. Perhaps if Eisenhower or Bush had not been president and a different leader had been less successful in avoiding war, the American ascendency would have been driven off track (as it was for a time by US intervention in Vietnam). Given its economic size and favorable geography, structural forces would likely have produced some form of American primacy in the twentieth century. Nonetheless, leaders’ decisions strongly affected the timing and type of primacy. In that sense, even when structure explains a lot, leadership within the structure can make a difference. If history is a river whose course and flow are shaped by the large structural forces of climate and topography, human agents can be portrayed as ants clinging to a log swept along by the current, or as white-water rafters steering and avoiding rocks, occasionally overturning and sometimes succeeding. So leadership matters, but how much? There will never be a definitive answer. Scholars who have tried to measure the effects of leadership in corporations or laboratory experiments have sometimes come up with numbers in the range of 10% or 15%, depending on the context. But these are highly structured situations where change is often linear. In unstructured situations, such as post-apartheid South Africa, the transformational leadership of Nelson Mandela made a huge difference. American foreign policy is structured by institutions and a constitution, but external crises can create a context much more susceptible to leaders’ choices, for better or worse. If Al Gore had been declared president in 2000, the US probably would have gone to war in Afghanistan, but not in Iraq. Because foreign-policy events are what social scientists call “path dependent,” relatively small choices by leaders, even in the range of 10-15% early on a path, can lead to major divergences in outcomes over time. As Robert Frost once put it, when two roads diverge in a wood, taking the one less traveled can sometimes make all the difference. Despite talk of a “zombie economy”, China’s state-owned enterprises have enjoyed a sharp rebound in profits this year, driven by resurgent commodity prices amid government-enforced capacity cuts. But economists worry that the revival of groups that once relied on state-directed loans and subsidies for life-support despite persistent operating losses may be unsustainable, and threatens to breed complacency about the need to reform SOEs. A buoyant property market has fuelled China’s unexpectedly strong economic growth this year and boosted construction activity. Heavy fiscal spending on infrastructure by Chinese local governments has likewise heightened demand for basic commodities such as coal and metals — sectors dominated by state groups. Profits at industrial SOEs surged 42 per cent year on year in the first seven months of 2017, following a meagre 3 per cent gain for all of last year and a 21 per cent drop in 2015, according to government data. Meanwhile, among lossmaking industrial SOEs, the size of losses have declined by a quarter. Stronger demand has also combined with tighter supply amid state planners’ efforts to shutter excess production capacity, especially outdated factories that produce heavy pollution. In a recent commentary, China’s official Xinhua news agency lauded the improved performance of SOEs and credited ongoing reform efforts. But there are reasons to doubt that SOEs can maintain their strong performance. Growth of property prices and investment are slowing, indicating that construction demand will soon follow. A top legislator warned last month that the economy was overly dependent on real estate, and big cities are tightening mortgage and purchase restrictions to control runaway prices. Some analysts also worry that apparent success will weaken policymakers’ resolve to push ahead with politically sensitive efforts to shutter state factories, which can lead to job losses and lower tax revenues. “I doubt the government will pre-emptively close SOEs. It’s difficult to define zombie enterprises, so if SOEs become profitable now — even if it’s just because of commodity prices — then incentives to shut them down will be much weaker,” said Shuang Ding, head of greater China economic research at Standard Chartered in Hong Kong. But optimists say the early success of capacity and production cuts in raising prices and boosting SOE profits adds to momentum for reform. At a key policy meeting in July, President Xi Jinping said cutting SOE leverage was a top priority. They also note that so far, capacity cuts and factory closures have not led to mass unemployment or social unrest. Jianguang Shen, chief economist at Mizuho Securities Asia, credits the combination of a strong job market and fiscal subsidies to laid-off workers. He expects SOE reform efforts to accelerate following the Communist party’s five-yearly leadership transition next month.